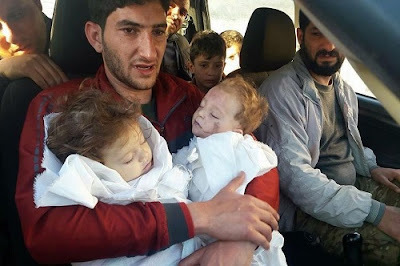 With a look of despair on his face, a grieving dad cradles the bodies of his twin babies as he sits in a vehicle in Syria. Wrapped in white blankets, the little boy and girl were among up to 100 people killed in yesterday's devastating gas attack. Usually smiling, happy tots, they died after being bombed by warplanes, believed to be carrying weapons containing sarin. Now, their heartbroken father wants the world to see these shocking photos to highlight the horror of the toxic gas attack. TOO SAD.